Born in Madrid in 1972. Graduated in Law from the University of Navarra and studied Theatre Direction at the Real Escuela Superior de Arte Dramático. Founded the company Producciones del Callao. Ha taught courses and workshops at La Casa de América, La Casa Encendida, El Teatro Nacional de Bogotá, La Sala Beckett and La Escuela Navarra de Teatro. Missing, Living Lavapiés, Cous Cous y Churros. In 2003, 2004 y 2005 wrote and directed Móviles, Calleidoscopio and Como levantar piedras sin hundirte en las aceras, 3 street theatre pieces for the contemporary theatre festival Valencia Escena Oberta. In 2006 and 2007, wrote and directed Risas y Destrucción. 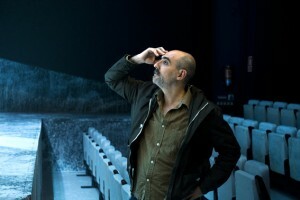 In 2009, directed Ramón Valle-Inclán’s La cabeza del Bautista. In 2010 wrote and directed Delicades (winner of the Max Award 2010 for best work in Catalan). That same year wrote and directed Días estupendos. In 2011 wrote and directed En la luna. Aventura! was first performed in 2013, and one year later came La calma mágica. In 1999 Alfredo Sanzol directed Greek by Stephen Berkoff for which he was nominated for Best Newcomer at the 2000 Max Awards. His show Carrusel Palace won the Madrid Region’s Short Theatre Marathon. His work Sí, pero no lo soy received 4 nominations for the Max Awards. En la luna won him 3 Max Awards.